Toshiba's Tecra A11-11H is quite an expensive laptop, so we were expecting great things. We certainly weren't left disappointed, with plenty of highlights to speak of, although this isn't quite a perfect machine. The Intel Core i5 520M processor provided an excellent benchmarking score, so anyone demanding plenty of power need look no further. Multitaskers can browse the web, enjoy their music and movies, and run intensive applications all at the same time, with no noticeable slowdown in evidence. 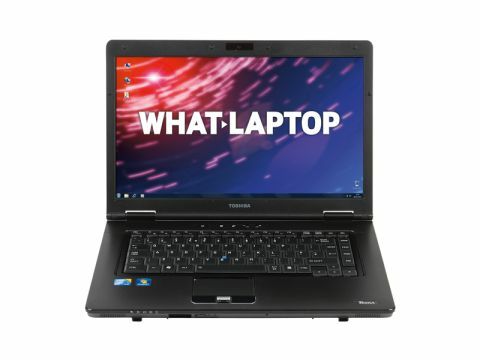 The Tecra A11 also features Intel GMA HD integrated graphics, which is best suited to basic multimedia tasks such as browsing photos and watching movies. That's certainly all you'll manage with the Toshiba, and anyone who wants to play the latest games or edit their media will need a machine fitted with dedicated graphics instead. The 269 minutes on offer here is a good result and anyone who regularly travels should definitely consider the Toshiba, although the 2.6kg weight and bulky chassis unfortunately reduce portability. We also disliked the cheap appearance of the Tecra A11, and the visible flex in certain areas of the chassis. However, the display does bend back to horizontal, so finding a comfortable viewing angle is easy. The screen itself is surprisingly vibrant despite the lack of a glossy Super-TFT coating. No gloss means no reflections, so anyone who wants a laptop suitable for outdoors use should consider this alongside the Asus P52F and Dell Vostro V130. We found the Toshiba to be highly usable despite the cramped touchpad, thanks to the excellent firm keyboard. We enjoyed touch typing on the well-sized, tapered keys. An alternative to the touchpad is provided by the pointing stick in the centre of the keyboard, complete with two dedicated mouse buttons beneath the spacebar, although this option may prove too fiddly and sensitive for many users. Toshiba has included a fingerprint scanner below the touchpad, as an extra layer of security. The 250GB hard drive is a little stingy as the Hi-Grade Notino D8000i offers double the storage space, but you do get plenty of ports including VGA and DisplayPort connections for hooking up monitors or projectors. An eSATA port allows fast data transfer with external hard drives, while one of the four USB ports offers Sleep and Charge functionality. Despite the cheap look and feel of the chassis, the A11-11H comes recommended. Performance can't be knocked, usability is excellent and there's a strong range of features, although more storage space would have been appreciated.